The handsome red brick warehouses that cluster north of downtown Minneapolis near the Mississippi River speak to peak 19th-century commercial traffic on the waterway and nearby rail lines. Many have more recently been reclaimed by some of the city’s most buzzed-about restaurants (including the Bachelor Farmer) and stylish shops (MartinPatrick3). Now the Hewing Hotel, opened in 2016 in a prominent warehouse that once stored farm equipment, pays homage to one of those trades — logging — in six stories of wood-framing, flooring and paneling. Channeling the spirit of an urban lumberjack, massive, rough-hewed posts picket the sunny lobby filled with low-slung leather couches. Patterned wallpaper featuring fish and moose and retro accessories on library shelves including vintage hockey gloves mirror Minnesota’s affinity for the outdoors. Minnesotans have returned the love, crowding the hotel’s ground-floor restaurant and bar Tullibee, which champions the bounty of the region with a Scandinavian accent. Fittingly, there’s a sizable sauna and outdoor hot tub on the rooftop, as well as a bar. 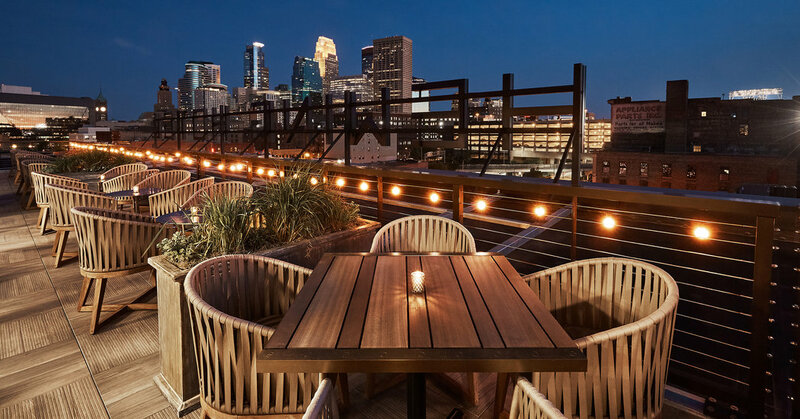 The Hewing resides in the gentrifying North Loop neighborhood, part of the Minneapolis Warehouse Historic District. Target Field, home to the Minnesota Twins, is within a few blocks. The Guthrie Theater, just over a mile downriver, is a quick Uber ride away. The MetroTransit Blue Line nearby links the neighborhood to the airport and the Mall of America beyond. The hotel’s 124 rooms benefit from the building’s warehouse origins with high ceilings, generous windows and exposed brick walls. Visible duct work lends an industrial edge, softened by full length drapes, a leather library chair stationed beside a floor lamp, plaid throw blankets from the regional Fairbault Woolen Mill Co. and the occasional use of Minnesota-motif wallpaper featuring deer, loons and boat oars in a pattern suggestive of Scandinavian folk art. Darkly stained wooden bedside tables with leather pulls repeated the organic theme, while a desk with open shelves veers in a modern direction. Mini bars deal local products including Tattersall Gin, Spruce Soda and Thumbs Cookies. While there is no coffee maker in the room, management provides free SpyHouse Coffee every morning in the lobby. Floor-to-ceiling white subway tile and rectangular porcelain sinks brighten the bathroom, though an ax, framed behind glass and apparently quoting the timber theme, made me think of emergency fire equipment. My ADA-compliant room, number 228, had a generous walk-in shower and a rain-forest shower head. Toiletries come from the grape-seed-based 29 by Lydia Mondavi. Guests are well-advised to make a dinner reservation at Tullibee when they reserve their room. The Nordic restaurant occupies half of the hotel lobby and the cocktail crowd sipping old-fashioneds commonly spills into the other half. Its chef Bradley Day, a native of Australia, seems to embrace the northwoods larder at Tullibee, named for a rare fish found in Minnesota’s deep lakes. The menu changes often but regularly features foraged and fermented ingredients as well as house-butchered meats. Recently, he gave Caesar salad a regional spin with aged Gouda and smoked smelt dressing, made his own lamb sausage and baked both bread and ginger cake in tiny Bundt pans, a salute to the local Nordic Ware cookware company that developed the popular ring pans. The restaurant is open for breakfast too; try house-made lefse, a traditional Norwegian flatbread, with cured ham. The top-floor hot tub, bar and 24-person cedar wood sauna are part of the Rooftop social club, open to members and guests who pay a fee. The pool and sauna are restricted, but the public can patronize the indoor/outdoor rooftop lounge in the evenings. For a different kind of sweat, there’s a fitness center and separate yoga room in the basement. The backwoods goes big city at the Hewing Hotel, where woody interiors and rustic décor warm the industrial setting, and dishes like pork wild rice sausage at its restaurant Tullibee feed the lumberjack spirit. Hewing Hotel, 300 North Washington Avenue, Minneapolis; 651-468-0400; hewinghotel.com.